Ronan Keating and Storm Uechtritz had a special performer on hand at their wedding reception on Monday. The pair, who tied the knot at Archerfield House and Golf Resort in Scotland, were serenaded by Thinking Out Loud singer Ed Sheeran. The 24-year-old reportedly took to the stage to perform solo before being joined by Ronan and his Boyzone bandmates Keith Duffy, Mikey Graham and Shane Lynch for a song. Former Westlife singer Brian McFadden shared the news of the impromptu collaboration on Twitter on Tuesday morning, writing: "Last night had the best jam ever. @BrianMcFadden @edsheeran @ronanofficial @officialkeith Mikey Graham and @shanelynchlife madness." He later shared a selfie of himself and Ed together, telling his fans: "We were confused!!!! @edsheeran." Ronan and Storm tied the knot in front of their family and friends in Scotland on Monday. As well as Brian and Ronan's bandmates, Danni Minogue also joined the happy couple for their big day at the picturesque golf resort. The bride's family flew in from Australia for Storm's special day, with her father Gordon walking her down the aisle, and Ronan's daughter's Missy, 14, and Ali, nine, joining the bridal party as her bridesmaid and flower girl. Meanwhile the groom had an extra special best man in the shape of his 16-year-old son Jack. 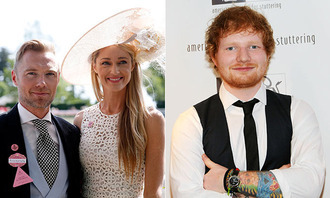 Ed is gathering a reputation for being involved in romantic weddings and proposals; he recently helped his friend Jake Roche propose to Little Mix singer Jesy Nelson, as well as orchestrating the on-stage proposal of Kodaline singer Jay Boland to his girlfriend Etaoin Corr. The singer, who is rumoured to be dating Nicole Scherzinger, also surprised two fans in Australia by performing for their first dance earlier this year.